Hand made Australian woodwork featuring individual and custom made items for the home. 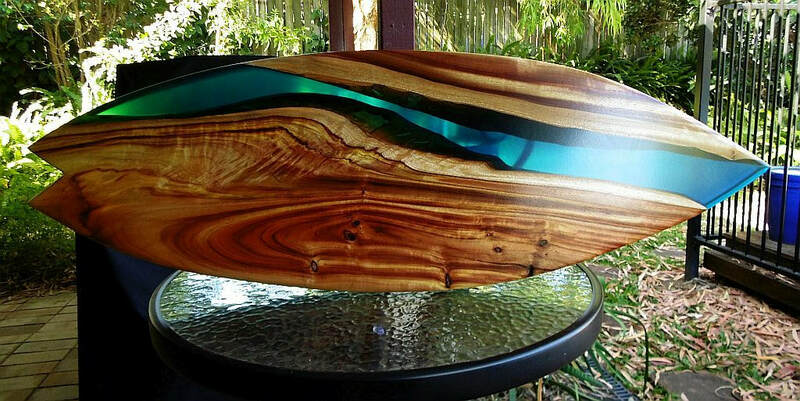 Bring the beach into your home with our beautiful resin and timber Surfboard inspired wall hangings. made from Camphor Laurel Timber and the highest quality Australian made epoxy resins. Each item is an individual handcrafted item and no two are ever the same. Combining resin with various timbers to make individual one off cutting boards. These will compliment any kitchen both as a functional cutting board and also as a work of art. Boards can be made in various shapes and sizes, with a range of resin colours. We can make a range of Camphor laurel cutting boards, from small personal size cheese boards right through to huge slab styled boards for the large family or serious entertainer. A number of novelty style boards are also available or you can hit us up with your personal design shape. For entertaining we offer a great range of camphor laurel platters. Like our camphor laurel cutting boards our camphor laurel platters are available in a range of sizes with 1, 2 or 3 recessed bowls. Great for the family gathering or a corporate function. We also offer a custom service so you can have your own shape and size custom made to your needs from camphor laurel timber or a range of other timbers. Lazy Susan's compliment any meal gathering by giving ease of access to food serving plates, condiments or a drinks selection. Our lazy Susan's are made using a range of timbers and feature a heavy duty cast aluminium revolving base. can be custom made in various sizes and timbers. Our range of hardwood cutting boards are made from sawmill slabs, sawmill off cuts and and other rescued, recycled or discarded timber. Boards range from small cheese boards, standard size cutting boards and right through to extra large bench style boards. Styles vary from single one piece boards that can be in a free form shape or a more traditional rectangular or square shape. we also make laminated boards and end grain boards. We hope you enjoy our Australian woodwork products.